Avrus Adas, a Dunmer priest, is a Layman of the Nine Divines and the resident priest at Leyawiin's Great Chapel of Zenithar. He also sells spells from the school of Restoration. A former priest at the Tribunal Temple in Kragenmoor, Avrus spends all of his time in the Chapel, doing his best to offer the same amount of charity and comfort as his he did in the Temple. He sleeps downstairs in the Chapel Hall every night between midnight and 6am. After waking up, he heads upstairs to the main part of the chapel where he spends all day wandering around, only interrupted at 8am, when he prays for two hours in front of the Altar of the Nine. At 6pm, he seats himself on the one the pews and consumes a two-hour dinner. He gets up at 8pm and spends the rest of the evening strolling around the chapel until he heads downstairs to his bed at midnight. He sells spells at all times, except when eating or sleeping. He wears a pair of braided leather sandals and a grey robe. He carries a small amount of gold. In combat, Avrus relies on the same spells that can be purchased from him. When you meet him for the first time, he politely introduces himself: "I'm Avrus Adas. I'm the priest of Zenithar at the Leyawiin Chapel." 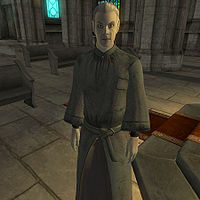 When asked about Leyawiin, he will give you a bit of background information and fill you in on his goals as a priest: "I used to be a priest of the Tribunal Temple in Kragenmoor. After the collapse, I drifted for a while, until I joined the Chapel. The beggars and the wicked Thieves Guild still trouble me. I wish the Nine Divines offered charity and comfort to the poor like the Temple did." Avrus can possibly die during the Knights of the Nine quest The Path of the Righteous, as he will be moved to the Chapel once you return from retrieving the Mace, no matter what time it is. If he dies during that quest, he will be replaced at the end of the Knights of the Nine questline (after Umaril the Unfeathered) by Aron Verethi who will sell the same spells offered originally by Avrus.